Mine In China book release giveaway party! Although I’ve had a link up for pre-ordering the book for a week now, I haven’t actually given the details on the publication. I have chosen to self-publish this book. My goal is simply to make the information available to potential families and families in progress. It can take up to 3 years for a book to go through the traditional publishing process. 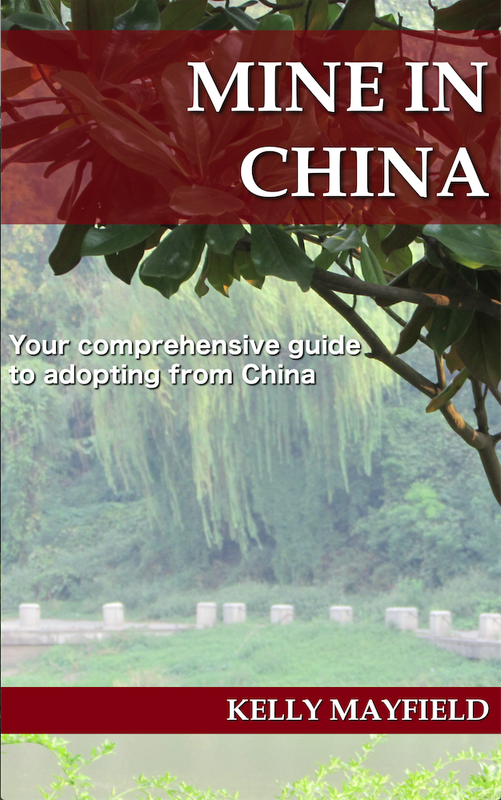 The information in my book has detailed timelines and information specific to the China adoption process right now, not 2 or 3 years from now. An e-book is much easier to update with the changes to the process that regularly occur. I doubt it would be of interest to a mass market publishing company as only around 2,000 people a year adopt from China. It’s a book geared to a very niche market. But it’s YOUR niche, so I hope you find it helpful. So here are your options–Mine In China is available as an ebook through Amazon. I tried to price it to be affordable to everyone. Maybe “e-book” makes you think of short, low quality, and lots of white space. That is not the case with this book. I wrote an actual book, containing over 150,000 words, which is available in the e-book format. At around 350 pages long, I’m pretty sure you’ll get $5 worth of information out of it! If you subscribe to Amazon’s Kindle Unlimited, you can read it for free. You might decide it’s worth it simply for the squatty potty tutorial! But I don’t have a Kindle! I understand, I’m not actually a big ebook reader either. However, you don’t have to own a Kindle to read the ebook. 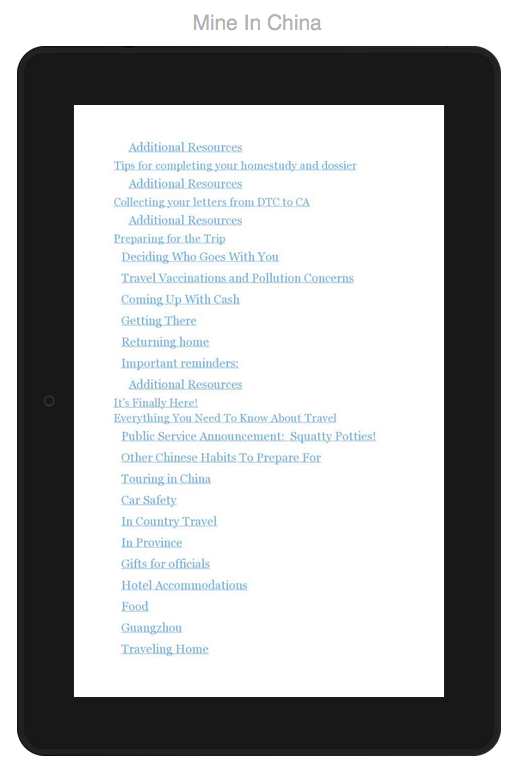 If you have a smart phone or tablet, you can download a Kindle app to read the ebook that way. If you are so old-school that you read the blog by firing up your wood burning computer, have no fear–you can even read the book on your computer. You can get the information on these options here. Once again, I do not have an Amazon affiliate account so I get no benefit by your clicks there. I suggest clicking through the Love Without Boundaries affiliate link so that their programs receive the benefits of your downloads. I just really like paper books! The good news is that I am planning on offering a paper book option. I will be using CreateSpace, a print on demand service. A paperback version of Mine In China should be available about a month after the ebook is published. You can hold out for that if it is your preference. However, due to publication costs the paperback version will probably be closer to $15. I’m guessing this will mean that most of the paper books will be sold to my loyal relatives. But hey, the option will be there for you. A nice benefit of this service is that libraries will be able to order the book. If even $5 is not in your budget, you can request your library purchase a print copy once it is available. Then others in your community who are considering adoption will be able to read it as well. I will notify you when this is available. Chapter 8: More Big Decisions: Which age? Should we adopt two? Chapter 9: Which Special Needs? To celebrate the release of my book I’m having a giveaway. There are two different options. 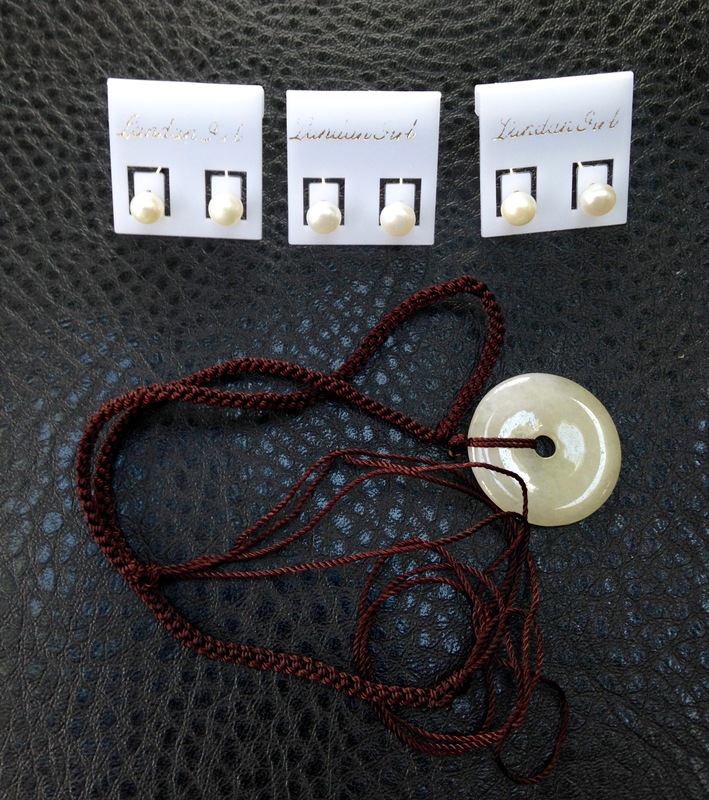 The prizes for this first giveaway are three sets of pearl earrings and one jade disk necklace. 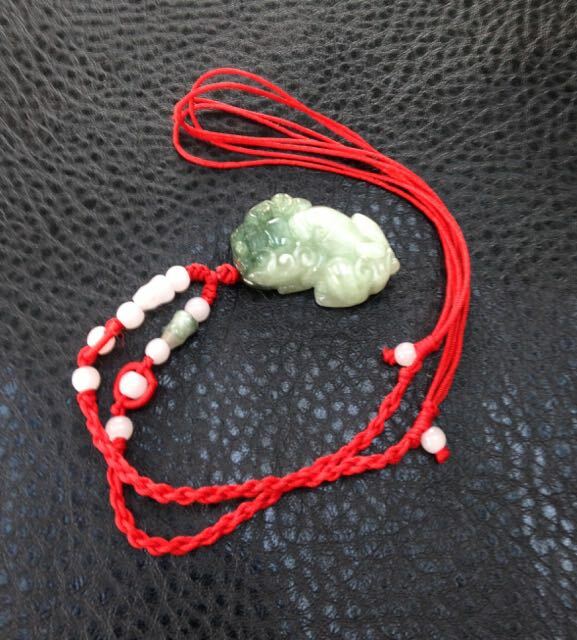 Please don’t be mislead by the words “pearl” and “jade.” These are inexpensive souvenirs from my time in Guangzhou. (1 entry) Leave a comment on this post letting me know if you are an adoptive parent, considering adoption, or just a random reader. (5 entries) Go to the Mine In China Facebook page and “like” the link to this giveaway post. (10 entries) Include a link showing that you spread the word about the giveaway on Twitter, Pinterest, Facebook, Instagram, or whatever your preferred social media hangout is. You may enter all of these if you like, but please try to include all of the info in your comment to make it easier for me to make sure I credit you with the correct number of entries. You will need to let me know your Facebook name so I can match that up with your commenting name. Winners of both contests will be announced on release day, April 4! *Must be over 18 to enter. *Only residents of the USA may enter. *Family members are not eligible to enter. *No purchase is necessary to enter either contest. *Contest ends at 12 am EST April 4, 2016. This entry was posted in Uncategorized and tagged Mine In China Book on March 23, 2016 by minefam. Love reading your blog. We are adopting an almost 9-year-old daughter from Shanghai, traveling most likely in June. Definitely going to order your book. Hi, can you please let me know your name so I can track your entry? You can send it to me by e-mail if you don’t want it to be posted on the blog. We are on our 3ed adoption from China. Liked your post and shared it on my Fb page (Stephanie Maxwell). I have also preordered the book. We are working on pursuing adoption for the first time from China! I look forward to reading your books as we are trying to learn all that we can!! Hi Rebecca, if you pre-ordered the book let me know so I can add you to that contest too. Thanks! Adoptive parent hoping to travel in May! Thank you for this resource ! I am excited you wrote this book!! I’m in the process to adopt from China as we speak! I also liked your Facebook post. And I will share on Twitter. Thanks for the entries! And all the helpful info!!!! My hubby and I are early in the process. I definitely need your book! I would like to enter the drawing. Have been praying for a long time that my husband would be moved to adoption of an older child (maybe 6-8) from China and have seen a very, very small step forward lately!